Kisses, Abandoned Mines, Flying Lizards, Baby Bighorn, VIP and Great Colors. What a Day! Valentine Day has come & gone and we are no worse off for the eating of endless chocolate. Our lips are just a little bit chapped though......if you know what I mean! A couple of days after Valentine Day we joined several of our co-workers and drove out to Anniversary Mine for a hike through The Narrows. Wandering Wingers Dave & Maxine were staying out at Stewarts Point so they decided to join us as we explored the area around the mine and slot canyon. We drove into the park to Mile Marker 16, then drove about 2 miles along one of the Approved Back Country Roads to a large wash. The wash is several hundred feet wide and about 40-50' deep. We drove down into the wash and then followed the wash further into the park. 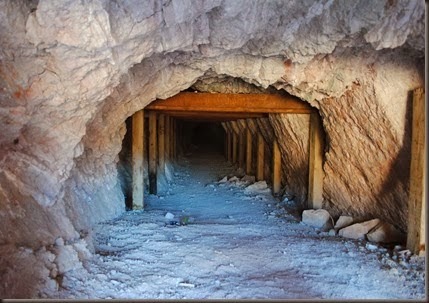 There are several old mines in and around the wash as well as being bordered by active mine sites on both sides. Here's a peek at the inside of one mine I 'borrowed' from Dave's blog. So if I go in here, do I end up over there? Several of the group checked out the entrance to mine as well as 2 small tunnels outside the entrance to the mine, probably used as a rail- or walk- way along the face of wash. Farther down the wash it narrows into a slot canyon, which everyone was interested to hike. We had gone out early, so we had the slot canyon to ourselves on the way in. And when we got to the far side we saw a small group of big horn sheep, including several babies. I'm glad we went early as we had 2 groups already hiking the narrows as we left and several groups hiking towards the narrows as we drove out of the wash.
Joan is always keeping her eyes open and checking out the surroundings. Looking up into one of the mesquite trees she noticed something unusual. Flying lizards? No, more like lunch. A *** lizard impaled on a mesquite thorn; more than likely placed there by a shrike. Speaking of lunch, our group split up after leaving the mine; some of them had to go to work; others to recuperate from the morning's activities. We were all feeling a little sketchy after the hike. We invited Dave & Maxine to join us for lunch. There is a smal chiiniese restaurant in nearby Logandale called VIP that we have enjoyed several times that we thought they would enjoy. And we were right (found out subsequently they revisited VIP a couple days later). After that we stopped by their boondocking site to chill out and watch the late afternoon color. Aside from our normal day to day activities, I've been very busy working with a realtor back in Florida. While we were in Florida at Christmas we visited friends and family, had our physicals, visited our rentals and met with our financial advisor (you have to do that kind of thing even though it's no fun). He suggested we consider selling one of our properties. The house Joan & I lived in prior to going full time still has a mortgage and due to the current housing market is still worth quite a bit less than the original purchase price. We've been fortunate that we've had it rented the entire time we've been on the road; however the rent we've been able to get doesn't cover the mortgage, escrow, HOA & management fees. I don't see the market changing any time soon so we decided it was time to cut our losses and try to sell the house. So if you're interested in a nice townhouse in central Florida overlooking the 9th green at a great golf course, let me know. Next on the list.......Income Tax......yuck! That's it for now. Stayed Tuned. More to Come. PS...Thanks for reading. As of last week stats indicate we've had over 40,000 page views. Who'd a thunk it? We're into week 2 of February and things are still rolling along out here in Lake Mead. 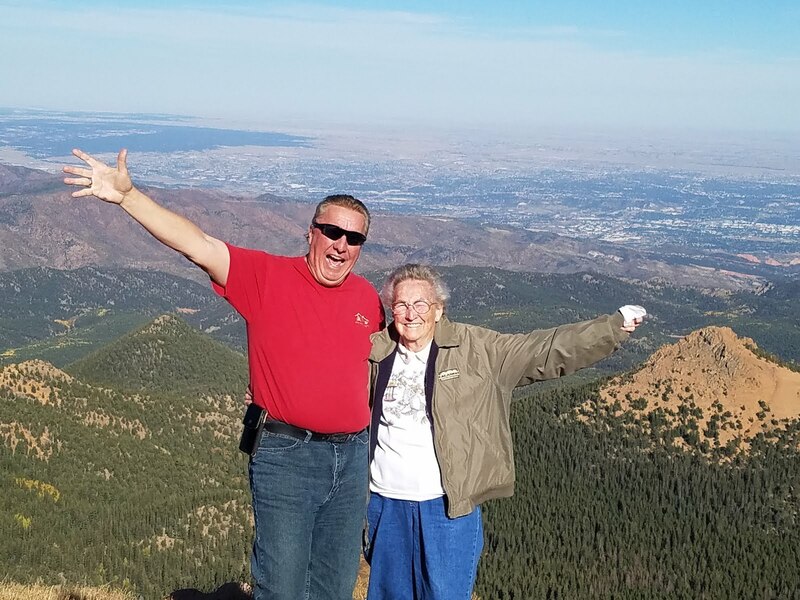 Our friends Dave and Maxine (Wandering Wingers) stopped by last week and spent a couple of nights here before moving on to a boondocking location further into Lake Mead. They're staying about 40 miles into the park at Stewarts Point just a few feet off the edge of Lake Mead itself. We're hoping to see them several times over the next few weeks to check out some of the hikes and back roads in the park. For those of you who may not know, on 2/11 Joan celebrated her 28th Anniversary. "Of what?" you may ask. Well she really doesn't like to talk about it, but I think it's great. It's the 28th Anniversary of a significant birthday. Yahoo! I'm looking forward to many more even if she isn't as excited about it as I am. 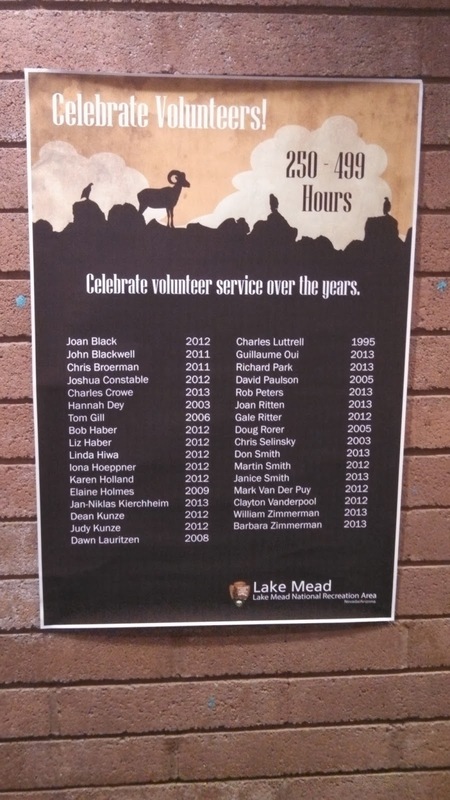 Last Tuesday the Park service held a small recognition party for all of the volunteers in Lake Mead. 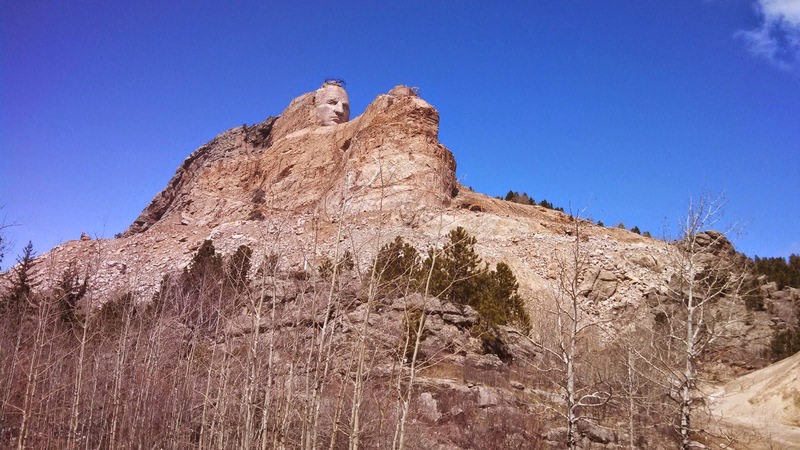 With sequestration and all of the shrinking budgets it's a challenge for all of the National Parks to maintain the level of services that visitors and tourists have come to expect. Volunteers are one of the solutions to that challenge. Lake Mead NRA has the 6th largest volunteer group in the entire park service with over 3000 volunteers registered. Many of those volunteers are from the Vegas area and contribute a minimum of 8 hours a month. 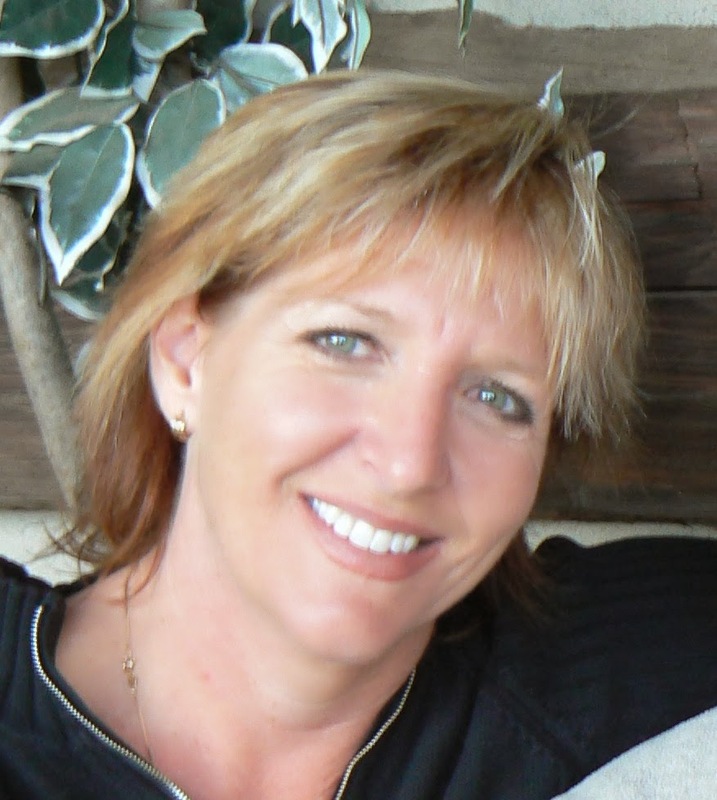 Another large group are like Joan and I, full or part time RVers that work a minimum of 16 hours a week. The various jobs include not only camphosting, but vegetation management, vehicle maintenance, visitor center, leading educational and informational outings for schools and private groups, water and boat safety & assistance. In 2013 volunteers contributed over 118,000 hours in Lake Mead; that's equivalent to 57 full time employees or a little over $2.1 million. pretty significant when you think about it. Joan and I are pleased to have contributed over 250 hours each since we started volunteering in January 2013. I managed to make a few mods to the MH over the last few weeks. One of our cabinets holds several pieces of electronics (DVR, Dish receiver, etc) behind a closed door with a glass window. Needless to say it can get fairly warm inside the cabinet which is not good for the electronics. Additionally we had a small gap over the top of our convection oven after having to replace the original last year. We've been looking for something with which we could replace the glass and fill in the gap. While strolling through the hardware store I stumbled across a 24" x 36" section of commercial lighting 'grate' which we thought might work. Works Great! Or is it Grate? 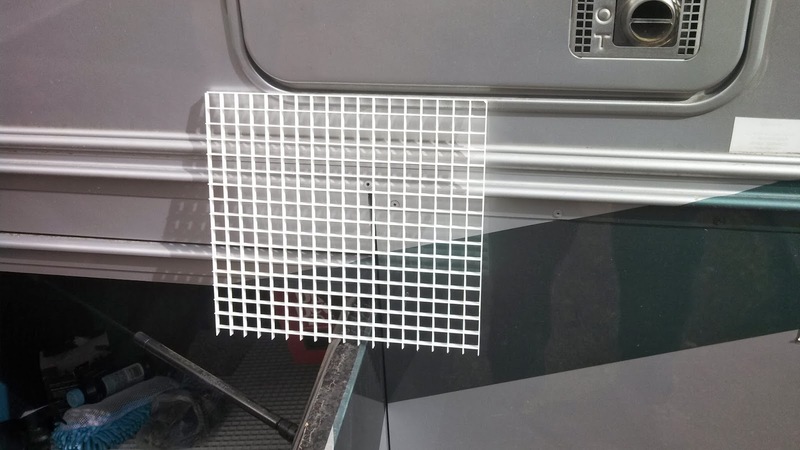 We measured the glass frame and microwave gap and cut the grate to match. Then painted the grate with black paint. What do you think of the finished product? 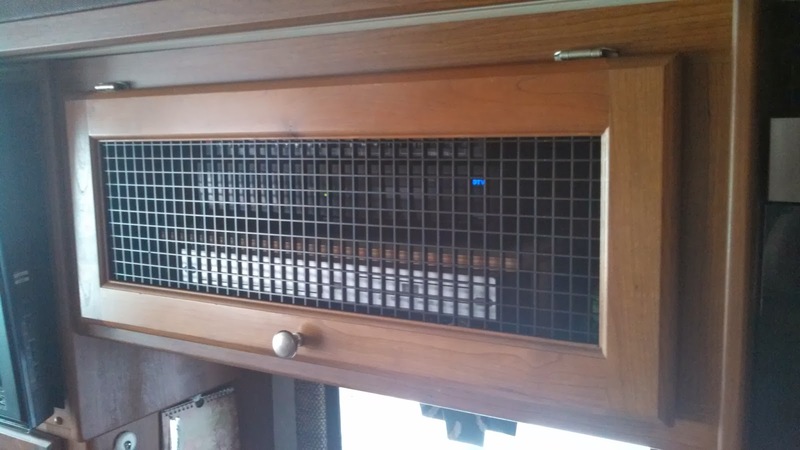 Our neighbors saw what we had done and having a similar problem with their electronics cabinet, we gave them the remainder of the grate which they similarly cut, painted and installed. Also I ordered and installed an LED light for our MH door handle. It was a fairly simple install. Just remove 3 screws holding the lower bracket; drill a small hole through the wall of the MH behind the bracket location; run wiring through the hole and splice into the wiring for the step lights. Secure the light in the base so that it shines into the handle (I used clear silicon) and reinstall the handle and mounting bracket. Now when I turn on the step lights (which are located in the step well inside the MH) the door handle lights as well. It's not only handy providing enough light to easily see where your key needs to go to unlock the door, but I think it looks nice at night. Each of the Approved Roads within Lake Mead NRA are numbered and there are approximately 150-200 roads with many of them having smaller side roads identified with an A, B, C identifier. Over the course of the last few months we've driven on almost every one of them. 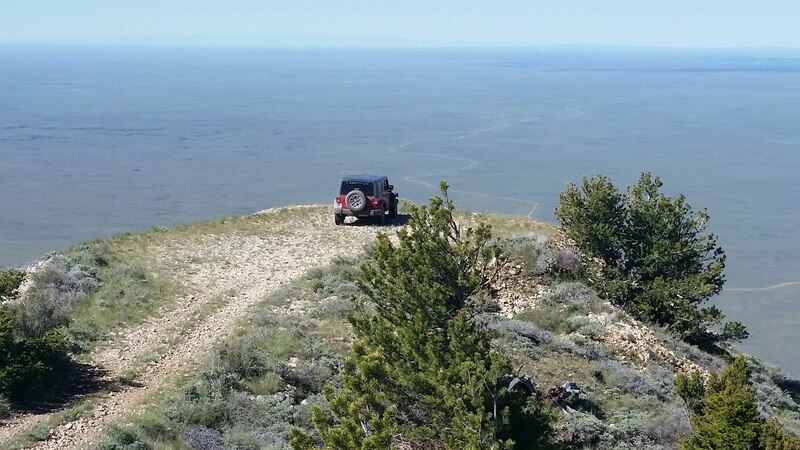 Last week we revisited one of the roads driven last November...and were we surprised. Check out the difference in the 2 pictures. Same spot but with a much different water level. This spot is on the eastern shore of Lake Mojave. 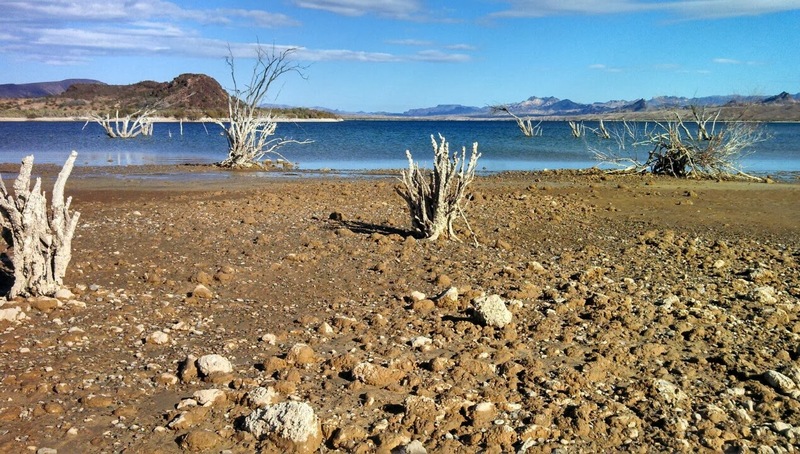 Even though Lake Mead is a little over 100' below its 'full' level, Lake Mojave doesn't seem to vary that much. 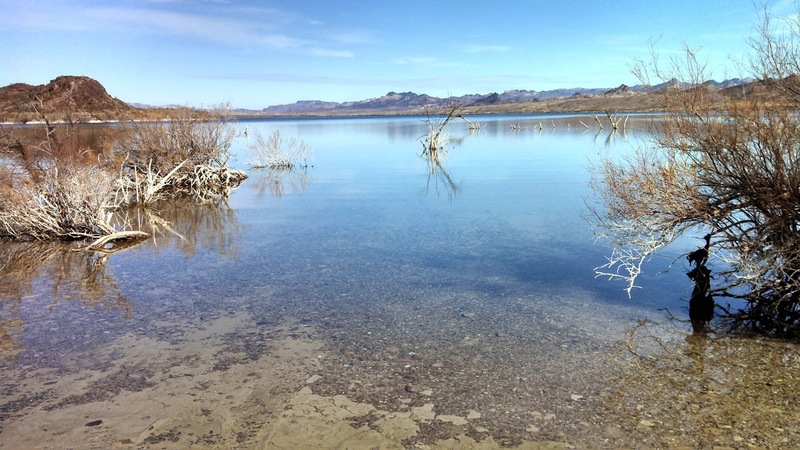 While the high water lines evident all along the Lake Mead shore line are 100'+, along Lake Mojave the water lines appear very small. By comparing these 2 pics you can see the water level appears to have risen 5-6 feet since our first visit. There are several websites that share lake level data with daily readings. Just Google Lake Mead water level and you'll get numerous links to check out. 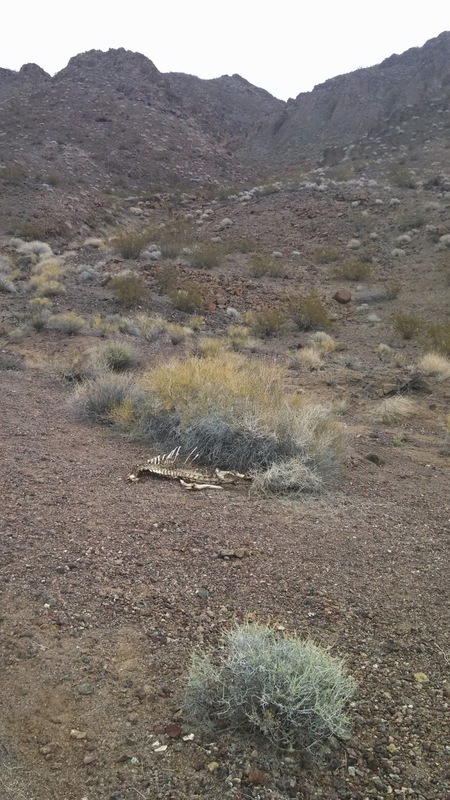 This is one of the things we enjoy about being in Lake Mead and our road monitoring position. The sights and scenes around us are always changing. The time of day-afternoon light compared to morning light; the browns of late summer, fall and winter compared to the greens of spring; you just never know what you're going to find as you drive around the park. Just make sure you bring lots of water. Wouldn't want you to end up like this. Our thoughts are that we'll try to return here after our summer job in South Dakota. I don't think we'll get bored. Friday night has turned into Game Night at our place. The neighbors stop by and there's no telling what games we might break out......Liars Dice, Fruit Salad, Golf, Qwirkle, Mexican Train, Left-Right-Center....and Poker is on the list.